Our Factory Showroom is open to the public from 9 AM to 5 PM Monday through Friday. Saturday visits are available by appointment. 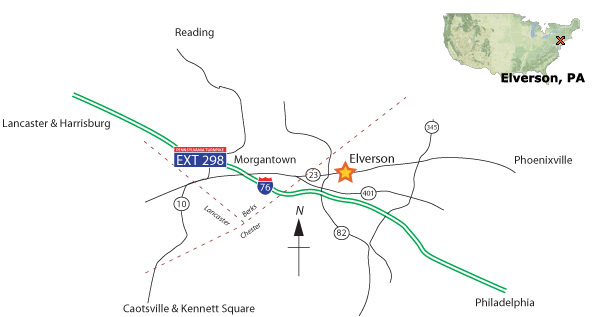 Take Exit 298 (old exit 22) Morgantown, Follow signs for Rt.10 south, Go to the second traffic light and make another left on to Rt. 23 east. We are about 3.5 miles down the road on your right. NORTH - take Rt. 100 south until you reach the intersection of Rt. 100 & Rt. 23. Make a right on to Rt. 23 west and we are about 9.5 miles down the road on your left. SOUTH - take Rt. 100 north until you reach the intersection of Rt. 100 & Rt. 23. Make a left on to Rt. 23 west and we are about 9.5 miles down the road on your left. Take Rt. 401 west to Rt. 82. Make a right on to Rt. 82 north. Follow to the stop sign and make a right on to Rt. 23 east. We are about 0.2 miles down the road on the right. Take Rt. 176 south until the road splits, stay to the right lane and continue on until Rt. 176 south ends. Make a left on to Rt. 23 east. We are about 3.5 miles down the road on the right. Take Rt. 322 north until you reach the intersection of Rt. 322 and Rt. 82. Make a right on to Rt. 82 north, follow until you reach the stop sign at the intersection of Rt. 82 and Rt. 23. Make a right on to Rt. 23 east. We are about 0.2 miles down the road on your right.